Many customers are very confused when their company approaches this topic. 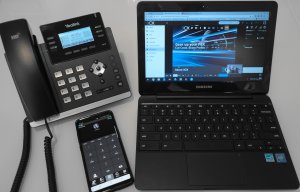 Nobody should consider purchasing a “phone system” without really considering their business process and exploring the world of Unified Communications and Collaboration (UCC). The likes of Avaya, Panasonic, Cisco, Toshiba, and a host of others are so far behind the curve for improving your internal and customer communications it would be like not having GPS in your car. You will hear a list of acronyms like, UC, UCaaS, NaaS, SIP, VoIP, trunks, hosted, LEC, CLEC and many others. I am not a doctor so I may not know the difference between a tibia and a fibula, but our staff can help you navigate and understand how it all works. Give us a call and if you don’t understand something stop our friendly staff member and ask for an explanation. UCaaS or Unified Communications as a Service, takes this to the next step so you do not have to worry about acquiring hardware and outgrowing the system. Blue Chip also provides all of the services at lower cost as an outsourced service. Before you consider hosted, on premise, virtual or the like you need to understand how a UCC can help your business. Let’s start with definition that will give us a loose idea of what we should expect. UCC (unified communications and collaboration) is versatile conferencing software that takes the various methods used in conference calls such as text, audio, video and virtual white boards and makes them available through a single interface. Communication, especially for brainstorming and presentations with audience interaction, can be greatly simplified by a single seamless application that enables the different interactions. One benefit is that users can devote their attention to the topic at hand rather than the operation of various pieces of software. However, in the past, UCC posed a number of challenges to networks with old infrastructure. In a network with separate compute and storage, these dynamic workloads can result in latency and congestion. As UCC and other dynamic workloads have increased, they have driven the adoption of hyper-converged networks to deal with the challenges. Blue Chip solves this by delivering it all through the 3CX UCC system and delivers it over a Wi-Fi network. Our engineers are able to provide high quality voice and data services. We deliver a secure network capable of leveraging BYOD (Bring Your Own Devices), improving your communications and access to the network. Get the free edition of 3CX’s Unified Communications with one year free hosting on Google Cloud. 3CX’s free UCaaS includes free web conferencing participants and unlimited extensions. Use your FREE business phone system either on-premise or Cloud, on Windows or Linux, or purchase or rent. Unified communications are completely deployed over secure WiFi network with the 3CX phone system. 3CX oﬀers a complete Uniﬁed Communications solution out of the box. Productivity boosting features such as Presence, corporate chat, whiteboard, screen-sharing and more allow for employees to collaborate better and work more eﬃciently.